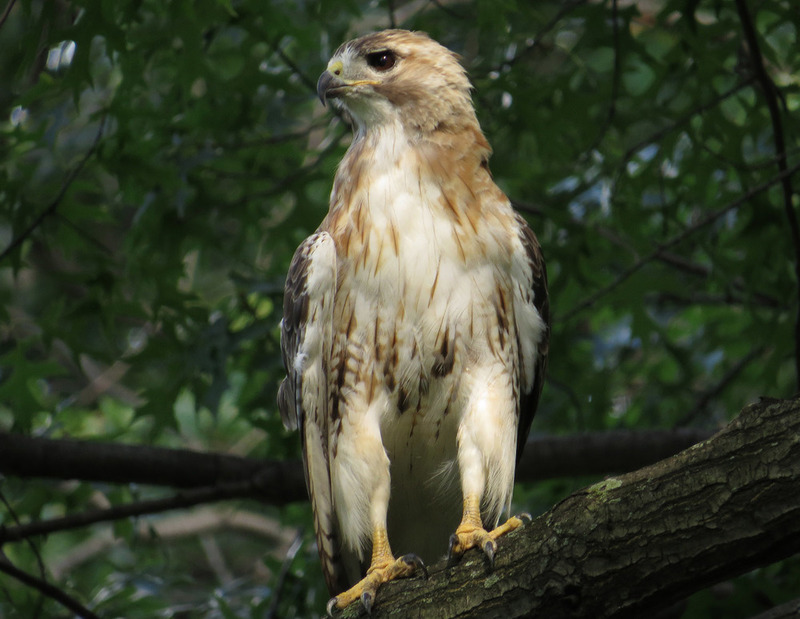 Pale Male is spending some quiet time in Central Park now that his two babies have learned to hunt and are on their way out of the park (one baby, Speedo, has been active recently, we are happy to report). I watched Pale Male for several hours on August 9, 10, 11 and 15, and put together a video showing his zen side. On August 10, I watched him near the 79th Street entrance to the park for two and a half hours. He say on a low branch, very quietly, until finally catching a small rat, eating it, and flying to the south side of the Metropolitan Museum of Art. Quiet Time With Pale Male shows Pale Male in the Ramble getting bombarded by jays and quietly calling out, perched on a low branch, hanging out near Turtle Pond before and during a rain storm, and perched high over the bridle path south of the Reservoir. August 10, 2016, at the entrance to Central Park at 79th Street and Fifth Avenue. I watched Pale Male for two and a half hours as he sat on a low branch. Some of my favorite photos here. These photos show Pale Male on August 11, 2016, near Turtle Pond. Pale Male was near the feeders in the Ramble on August 9, getting squawked at by blue jays.